Organic lifestyle mattress enclosure has greatly reduced the “new mattress” odor from my kids’ bedroom. This oroduct has given me much peace of mind! "I simply love what OrganicLifestyle. com is doing and thought you'd want to know"
Greatly appreciate the fact the parcel arrived before Christmas when the date of delivery stated December 28th. The granddaughters loved the softness of the product. For Christmas, I purchased two bamboo throw blankets for each of my daughters to use on the couch while watching TV or however they chose. I am thrilled with the weight and feel of the blankets. My youngest claims the bamboo is as soft as her silk blanket. Both are using them daily. Personally, I am jealous of not having one and plan to order a couple more. Great product. No off gassing was experience when taken right from the package to the bed. We highly recommend this company and their exquisite products. Great experience each and every time! Everything from website functionality, product selection, ordering, trouble-shooting of problems if necessary, responsiveness, follow-through, follow-up, special orders, payment, and delivery is highly professional. I highly recommend Organic Lifestyle for healthier, more sustainable, and more responsible living. WOULD YOU LIKE TO ADD YOUR FEEDBACK? Dihan, you're such a gem!! Thank you so, so much. How truly kind and generous of you. My dear friend, Tiffany, has chemical sensitivityand it's hard for her to find things that she likes that don't make her ill. This is the fourth time I've ordered from Organic Lifestyle and she loooooves everything I've gotten for her. I just really appreciate and am very grateful for the quality of such beautiful products that you all supply. Thank you for continuing to make every occasion with Organic Lifestyle pleasurable. Hello again!! I got my sheet set today. They look and feel fabulous and can't wait to sleep in organic bliss. 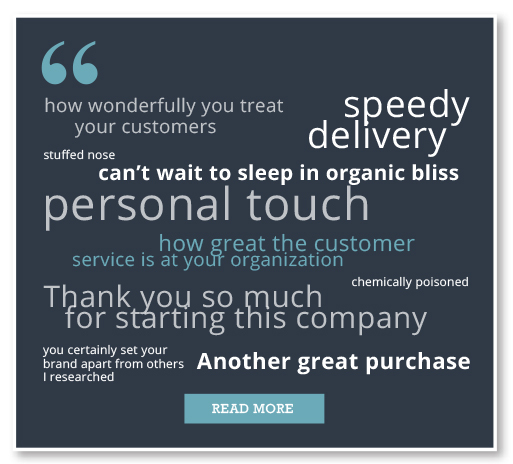 Your online store has been a delight to deal with and you, personally, have been more thoughtful and kind than we could have imagined in this modern impersonal age. A far cry from the anonymity of corporate companies, your personal touch is so very appreciated. Yes, I got the pillow yesterday! Wow it is so comfortable - my boyfriend slept on it this morning and now he wants one too. We are so pleased with everything we've purchased from Organic Lifestyle, which at this point is 4 organic cotton pillows, 8 sateen and flannel organic cotton pillowcases and a lovely, soft organic cotton blanket. When our son was chemically poisoned, we had no hope that he would ever be comfortable with safe bedding again. While organic cotton bedding is more expensive than ordinary bedding, it's well worth every penny paid. I LOVE them... very soft and the perfect fit ! Love the sheets, they are the most comfortable set of flannel sheets we've ever had!